This is not based on adaptation of existing models, but an entirely new concept created to maximize flexible usage in order to optimize monetization. Driverless rides could be half the price of today’s ride-share journeys, if the cars were used day and night and carried interactive adverts. It is building fleet management software, dispatch, routing, and payment systems; delivery customers; and digital content and services for passengers.Waymo promised commercial self-driving taxis by the end of this year. GM says it will follow in 2019. Ford’s vehicles will not be based on existing cars but on a new autonomous-only vehicle capable of being configured for passenger, cargo or food delivery, and (without) traditional steering wheel, gas, or brake controls. Anyone summoning a Ford self-driving taxi after the company’s service launches in 2021 could be offered detours to sponsoring stores or wind up riding alongside packages out for delivery. At an event to showcase Ford’s progress in developing autonomous vehicles, the carmaker said its driverless rides could be less than half the price of today’s ride-share journeys,if the cars were used day and night and carried interactive adverts. The firm is also insistent that it is not lagging behind Waymo, which has promised a commercial self-driving taxi service by the end of this year, or GM, which says it will follow suit in 2019. Ford presented scenarios in which passengers could make in-car purchases of groceries to be delivered directly to the vehicle’s trunk, or make pit stops for recommended snacks and drinks. The car would then adjust its suggestions as Ford “built its relationship” with the passenger, said a spokesperson. 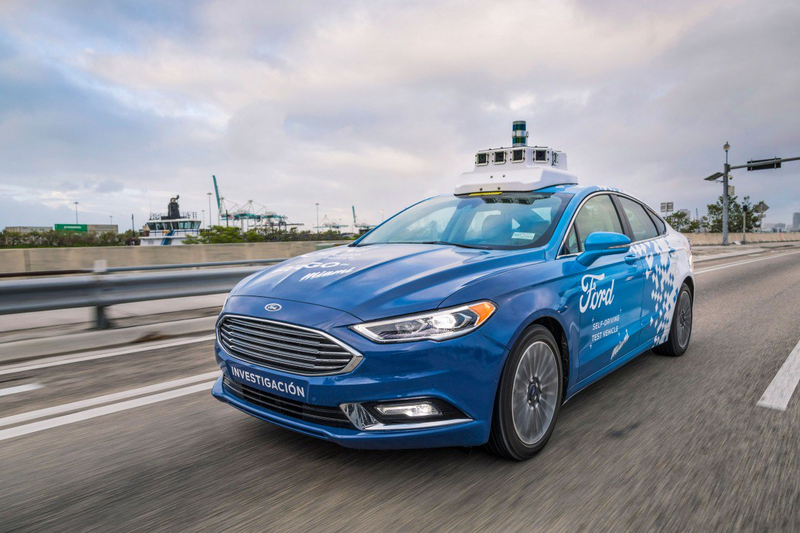 In Miami, Ford also offered the first public rides in cars powered by Argo AI, a startup founded in 2017 by veterans of Google’s and Uber’s self-driving programs. Ford became Argo’s majority owner later that year, with an investment of $1 billion. 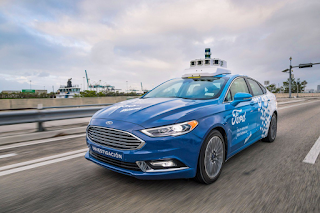 Ford has been testing Argo’s autonomous vehicles for delivery in Miami and elsewhere, racking up over 1,000 deliveries of Domino’s pizzas and Postmates packages, albeit with safety drivers behind the wheel. This week, it announced a similar partnership with Walmart. Ford pegs the total market for autonomous vehicles at over $330 billion by 2026. Ford demonstrated an Uber-style smartphone app to summon modified self-driving Ford Fusion sedans, again with human safety drivers. The cars took journalists on several trips through downtown Miami—a driving environment described as “double black diamond hard” by several Ford executives, in reference to the most difficult downhill ski runs. On three separate journeys totaling about four miles, MIT Technology Review experienced the cars driving generally safely and competently on roads that included wayward pedestrians and many aggressive car and truck drivers. However, the cars failed to demonstrate social driving skills at stop signs and crosswalks—and still lack the ability to reverse or read road signs and turn signals. Ford’s launch vehicles will not be based on existing cars like the Fusion but on a new autonomous-only vehicle currently in development at FAV. The vehicle will be capable of being configured for passenger, cargo or food delivery, and will not feature traditional steering wheel, gas, or brake controls. Argo CEO Bryan Salesky told MIT Technology Review that the vehicle would use lidar, radar, and camera sensors, and confirmed that it would be ready for Ford’s 2021 launch date. The company is already diversifying beyond of its traditional business model of selling cars. Chariot, a micro-transit company Ford acquired in 2016, is offering first-and-last-mile services to businesses and local government in Transit vans. Ford also just bought Spin, a dockless electric scooter startup operating in a handful of US cities and university campuses. And in August, Ford launched a small health transport service called GoRide in Michigan. All three initiatives provide data about customer behaviors and expectations that will inform future autonomous services, said Marcy Klevorn, head of mobility at Ford.